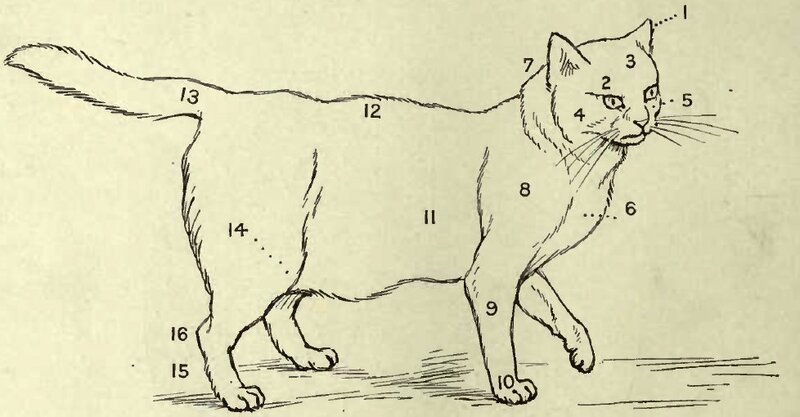 BEFORE entering upon the distinctive breeds of cats, of which I propose to treat fully in the ensuing chapters, I would draw attention to the accompanying diagram of a cat, and will proceed to point out the general contour of the animal, whether long or short haired. No. I, Ears: These should be small, and rounded at the tops, carried somewhat forward, and not wide open at the base. In the Persian varieties especially the inner surface should be hidden by a growth of fur extending from the face, termed ear tufts. It is a beauty in the cat to have the ears set well apart, giving an appearance of greater width to the head. The outer portion of the ears should be evenly covered with soft, short, downy fur. No. 2, Eyes: These ought to be round, large, and full. A small, beady eye is a great disfigurement in a cat. The eyes should be set straight in the head, not slanting like those of a Chinese. In the Persian varieties a fringe of overhanging fur greatly improves and softens the expression. The colour varies in different breeds, but in green, orange, or blue eyes, purity and depth of colour should prevail. Very often an orange eye is spoilt by an inner rim of green, and a blue eye is weakened by a paler shade of blue, giving the appearance of an opal. No. 3, Skull: Should be broad, with width between the eyes and ears. No. 4, Cheeks: Well developed. No. 5, Face and nose: These should be short; if the contrary, a „snipey“ appearance is given to the cat, which quite spoils the expression. No. 6, Chest: Should be full and bread. No. 7, Neck: Short and full. Nos. 8 and 9, Shoulder and fore arm: These call for no special remarks; but in male cats especially firm and massive limbs are most desirable. No. 10, Paw: A large, broad paw, with short but not stumpy feet. In the Persian varieties the tufts are an additional beauty. Nos. 11 and 12. Body and back: There is a diversity of opinion as to whether a cat should be long in the body or of cobby build. I incline to the latter as regards beauty of form, but I am of opinion that female cats with long bodies are the best breeders. All cats should be low in the legs. No. 13, Tail or brush: In both breeds this should be short rather than long, and in the Persian varieties broad and spreading. The tail should be carried almost on a level with the body, and slightly curving upwards towards the end. A too-tapering tail is a defect. Nos. 14, 15, and 16 call for no further remark beyond the desirability of symmetry in form. 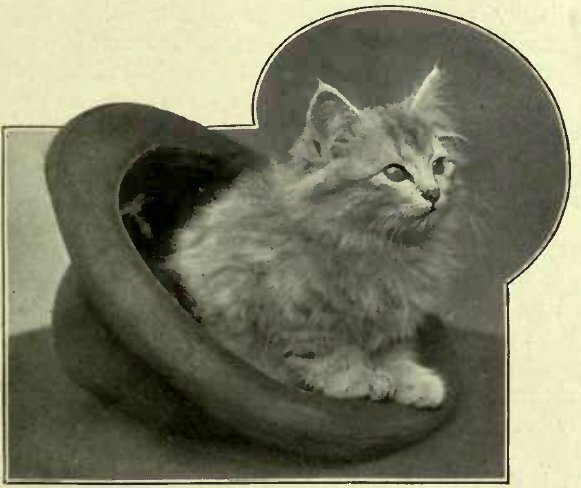 The foregoing list of points in a cat may be of some service to novices in the fancy, but it is necessary to add that, as in all animals, condition is a very important factor. 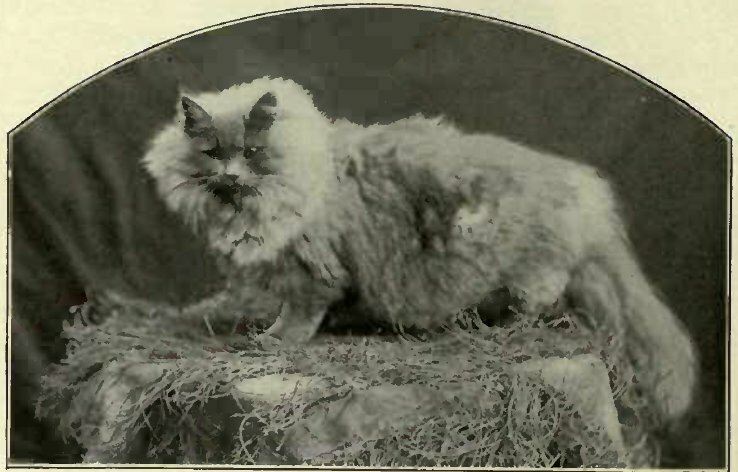 A cat may be perfect in all points, and yet if in either the long- or short-haired varieties the coat lacks softness of texture, and in Persians the fur is matted or draggled, such specimens cannot expect to find favour in the eyes of a critical judge, or even an ordinary lover of cats. In short-haired breeds there is an unmistakable gloss on the coat of a cat that is in good health. A spikey appearance of the fur always denotes poor condition, and greatly detracts from the charms and chances of our pets or show cats. A great deal depends in keen competition upon condition. It turns the scale in a vast majority of instances. Therefore, as great attention should be paid to this point as to those set forth in the list I have given. A small yet distinctive feature in a cat is the whiskers, and these vary in colour, according to the breed. They should be strong and yet sensitive, and curving slightly inwards. It is supposed to be a sign of strength if a cat’s whiskers attain a great length.